No Man's Sky PC Port Is Broken; Players Reporting Performance Issues - Steam Reviews Are "Mostly Negative"
No Man’s Sky, one of the most expansive games ever created, is out on PC. Three days after its PlayStation 4 launch, the game is finally up for grabs on Steam and GoG for everyone who’s got a decent rig. Things, however, aren’t looking great for those who are ready to start their journey across the game’s beautiful and vast procedurally-generated universe. Players are reporting poor performance, even with top hardware, and FPS drops, stuttering, crashing have all amounted to the game sitting at a “Mostly Negative” user review rating on Steam. No Man’s Sky is having a bad launch-day on Steam. More than half of the players who have purchased the game since its release have left fuming, negative reviews. It’s not the content of this highly anticipated space exploration game that users are mad about, but rather its shabby performance on the platform. Players are reporting all sorts of issues that are hindering the game’s technical performance, making it almost unplayable. According to reports, No Man’s Sky is crashing immediately upon startup, while massive frame rate drops, stuttering, frequent crashes during gameplay, screen-tearing, etc., are all among the issues that currently plague the game. Users are branding the game “unplayable” not only on systems that go along with the game’s minimum hardware requirements i.e. Nvidia’s Fermi-based GTX 480 graphics card coupled with 8GB of RAM and an Intel Core i3 processor, but also on machines that are way over-spec’d for Hello Games’ latest adventure title. 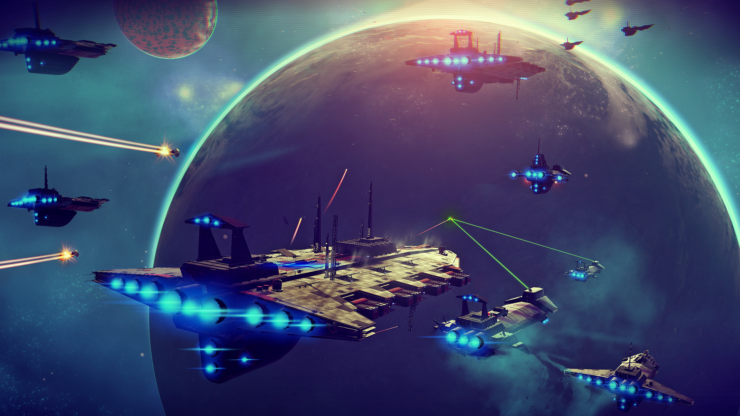 Hello Games is, of course, well aware of what is going. 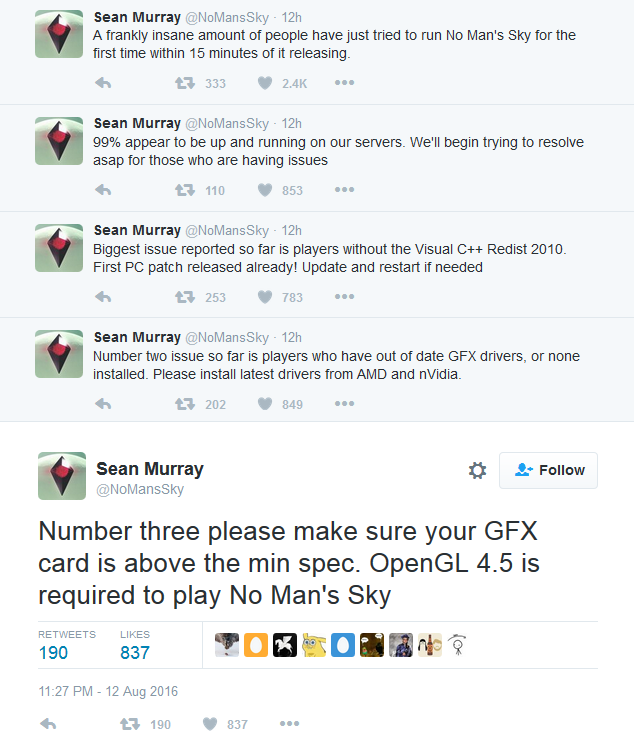 Director Sean Murray took to Twitter shortly after the release of No Man’s Sky on PC to ask users to make sure their video cards are compatible with OpenGL 4.5. He pointed out that one of the major issues that many players are facing is that they don’t have Visual C++ Redist 2010; you can download it here. It is also recommended that players make sure their GPU drivers are up-to-date (go here for latest Nvidia drivers and here for AMD drivers). Murry also stated that the team has already released a patch to address the initial issues and bugs. He did not reveal which issues the patch exactly addresses. Many players who have installed it haven’t noticed considerable change in performance, so it is probably a quick fix for the startup crashes. The team is, of course, working to resolving all the reported issues, until then, the instructions tweeted by Murray will hopefully prove useful for affected players. We will keep you updated. These are apparently just launch-day issues, and since Hello Games is already at it, they will hopefully be sorted out soon.